From 198 paintings in this exhibition, Joan Cole was chosen to receive a $200 prize for "Day's End." t Lake Sunrise" "Crescent Lake Sunrise" is an 8 x 16" acrylic on canvas by Joan Cole. This is a very peaceful scene on a quiet morning in New Hampshire. Two of my paintings have been chosen to hang in this exhibition: "The Quiet Place," as well as "Moraine." The opening reception and awards ceremony is on Saturday, September 8, 2012, from 4-7 PM. All are welcome. 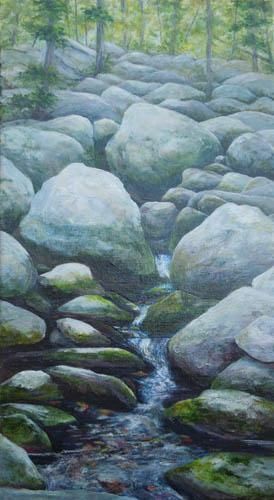 "Moraine" is an original 24 x 12" acrylic painting on canvas of a glacial moraine in Chatfield Hollow, which is part of the Cockaponsett State Forest near my home. "....My assignment as Juror was to select approximately 120 works out of the nearly 400 submitted. I was pleased to see such diversity of approaches across all media. In the end, I tried to reflect that diversity with a representative selection of works marked by creative expression and proficiencies of execution. I also found works with a "spark" of originality...."
Works in sculpture, oil, acrylic, watercolor, grapics, and mixed media will be on exhibition till April 1. The opening reception is Sunday, March 11 from 2 to 5 PM. If you are in the area, please come enjoy the show. This is a one-woman show that lasts until January. If you are nearby, I hope you'll stop and enjoy viewing these paintings.